Chris Frome snorts, misses a gear and sees the chain jumping … then he changes the bicycle and starts again. 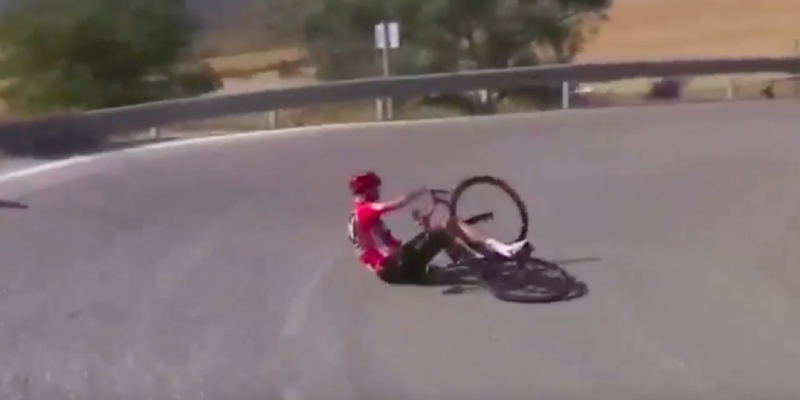 He put too much energy needing to return in the peloton, so he force on pedals but the low lucidity in the curve makes him fall. The skill, the real one, is to keep the cold blood to be able to regain the mental serenity after the fall and challenge the tension of those who just made a double mistake on live TV. In the end he is the one who has everything to lose as he is the strongest, but he is still in advantage over the opponents in the overall standings, and with a beautiful 40 km crono still to be disputed. “The front wheel slipped and the asphalt was dangerous,” he explains after his arrival. And here the psychological trap hits the opponents who do not have the courage to stick it to the bottom. The race is a serious thing where you should never hide behind the goodness of FairPlay. At that point Nibali and the others should continue their action and trying to gain gap. Also at the Giro d’Italia we witnessed the group’s lost moment after the famous Tom Domoulin country break. The fact remains that the Dutch has won the Giro and his rivals have missed the lead for a few seconds. Today Nibali gains and takes less than a minute, but could do better. Who comes out of as winner today is Alberto Contador who attacks from afar. The Spaniard is not one to sprint at a kilometer from the arrival. He throw in the melee at less than 20 km to do. Sure this is his last season and he wants to leave a great memory. He does not need a placement, he is just looking for the support of his fans who are very crazy in Spain. On this day of the Iberian sun there is another winner, is Polish Tomasz Marczynski who for years has not won but in Vuelta 2017 has centered the target already 2 times. Tomorrow we expect 206 km from Malaga to Seville. The stage should be suitable for sprinters or the hunters.